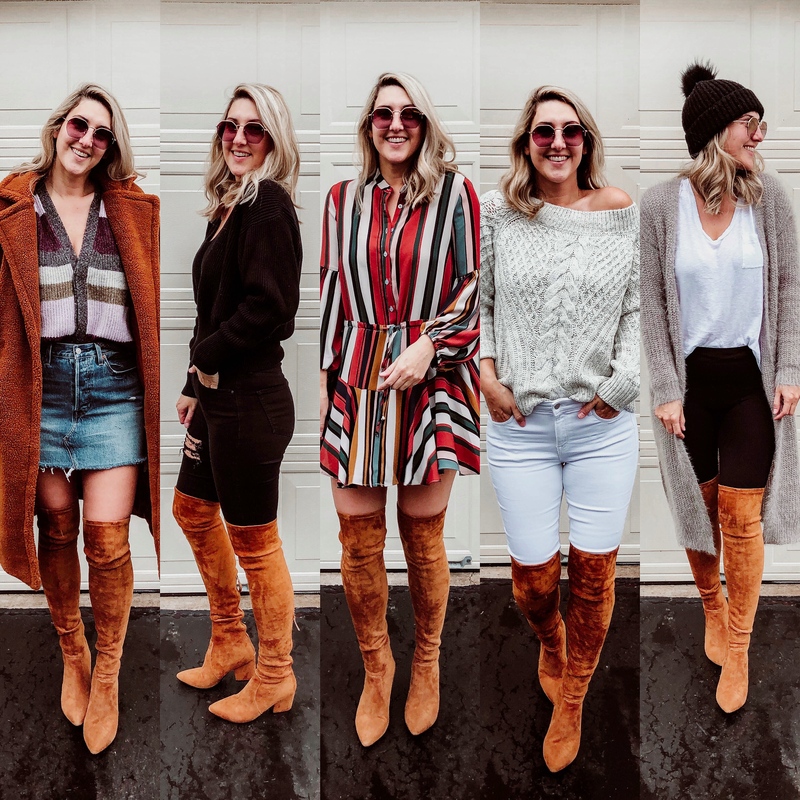 Use code XOXOMARY for 40% of these boots! 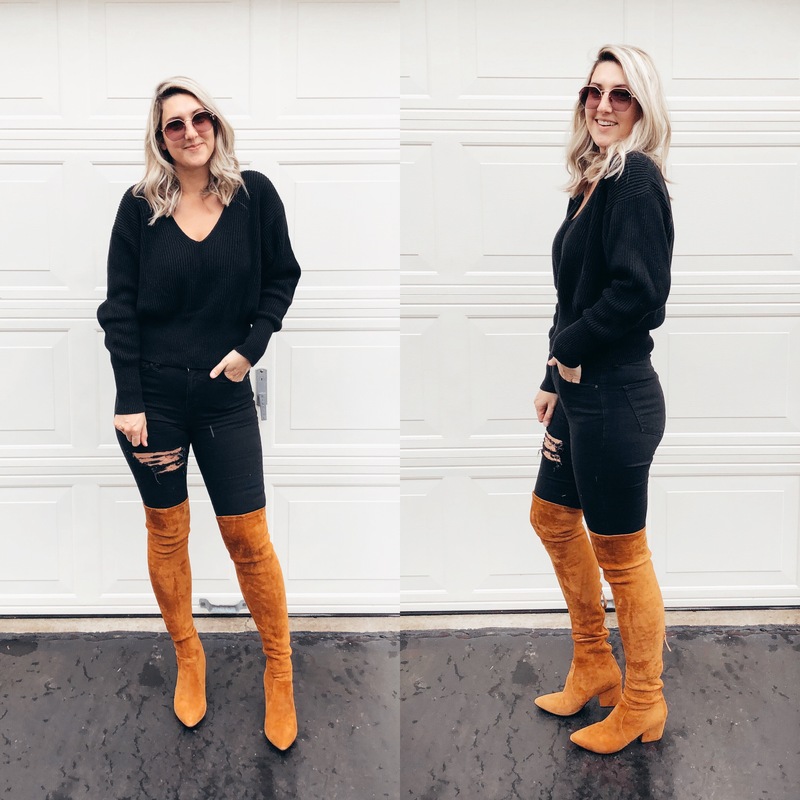 Unless you live under a rock on Instagram, I’m sure you’ve seen your favorite blogger style these boots. They are the “it” boot of the season (past seasons, as well), and for good reason. I have to admit that I was skeptical of buying from this site and didn’t know if the quality would be good. Well, I’m here to tell ya, it’s legit and it’s GOOD. Goodnight Macaroon has sent me 2 boxes of goodies now, and everything has been excellent quality and true to size! 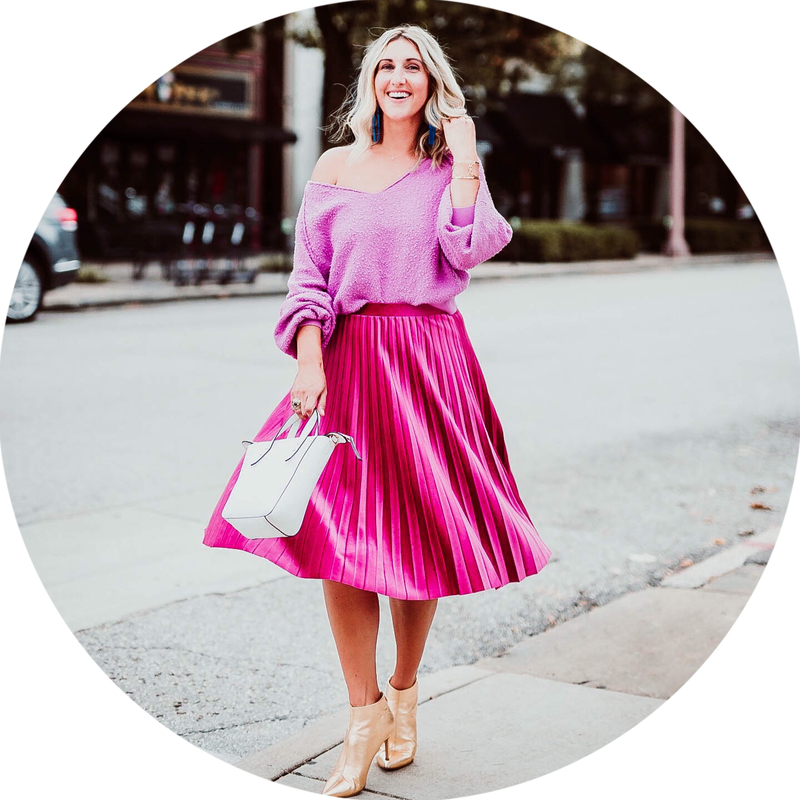 Today I’ve styled them 5 ways for you, but really, the possibilities are endless! You can swap out any variation of what I’m wearing. The boots also come in grey HERE, and black HERE. So, let’s get started, shall we?! I am completely on board with denim skirts, maybe it’s the 90’s in me, but I love them. I’m such a denim girl, so a denim skirt is like a dressy option for me haha. This can be swapped out for any skirt, though. It’s also good for cold weather because most of your legs are covered. I’m not a tights girl, so I will gladly bare my legs for a few minutes in the cold, than wear tights. However, if you love tights, you can most definitely pair tights with this option. My fabulous teddy bear coat is also from Goodnight Macaroon and is SO GOOD. I am completely obsessed. I’m wearing the medium here (my true size), and it fits just as it should. It’s an oversized look. This would also be 40% off with code XOXOMARY! You can find the coat HERE. The sweater is from Heartloom, and can be found HERE. My denim skirt is from Levi’s. I am not an all black type person these last few years. Black used to be the only color in my closet, but now I need color. When I reach for something black, I usually put it back and settle with a bright color. However, there is nothing like an all black look! It’s so chic and I always end up loving it. I also LOVE to pair black and brown together. 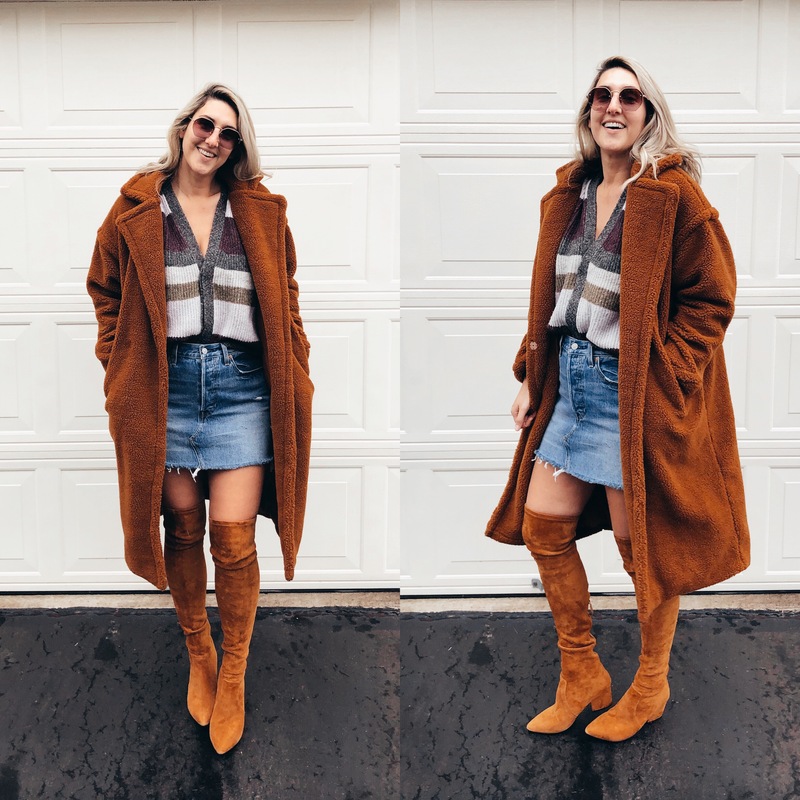 I chose the cognac boots because they truly go with everything. Are you drawn to color more, or do you love black? This dress is from Red Dress, and can be found HERE. I love this dress so much!! The cut and colors are absolute perfection, in my opinion. 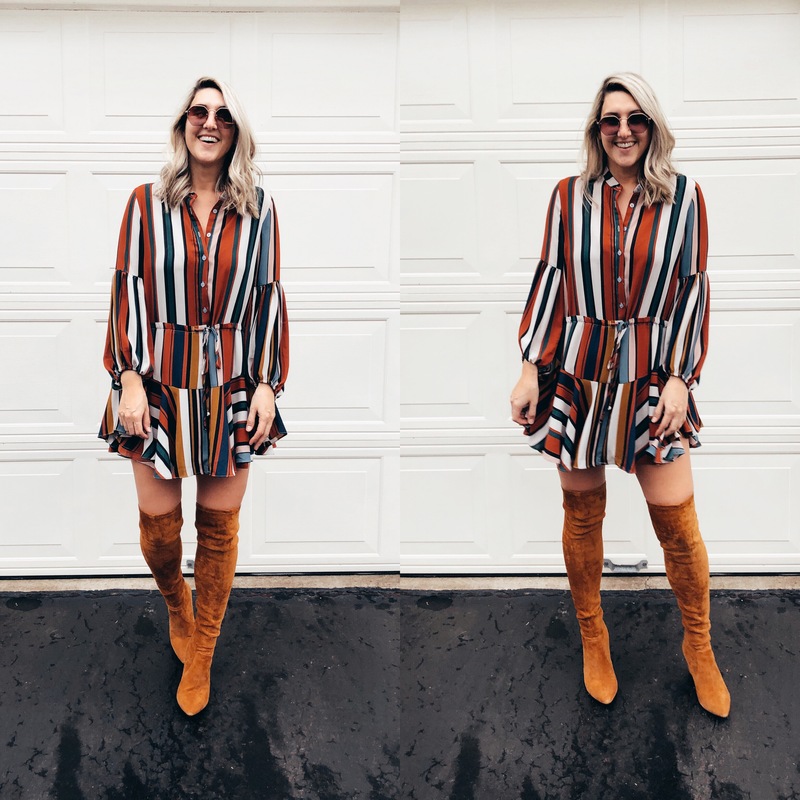 You can obviously pair these boots with pretty much any dress under the sun, but I do think it’s looks extra good with a flowy one (insert dancing lady emoji here)! You could also add the teddy coat with this dress, or a denim jacket, or leather jacket! 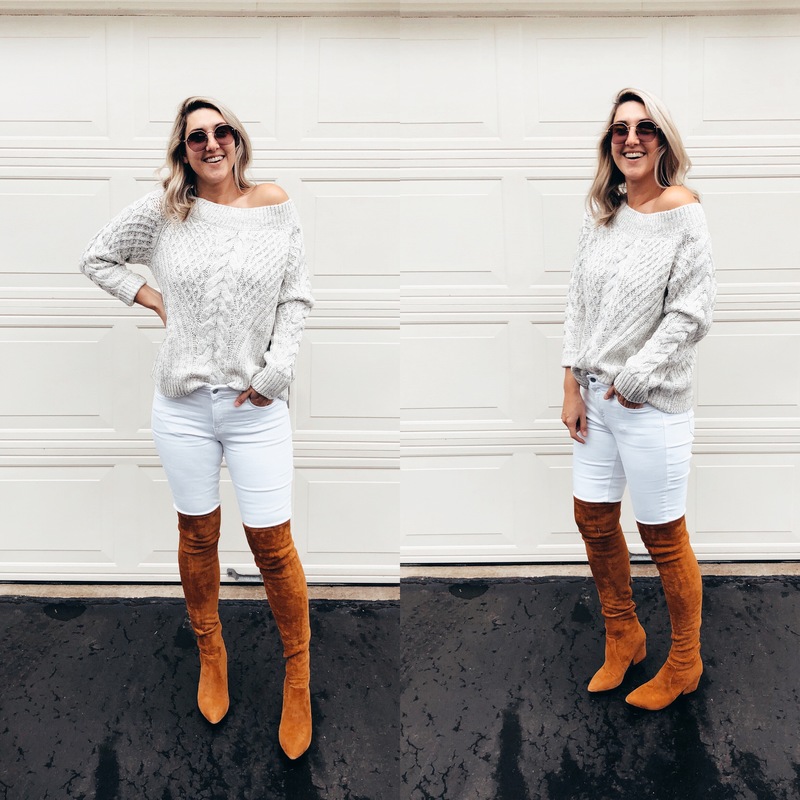 I am such a fan of a winter white look. I usually only wear white denim in the winter, oddly enough. 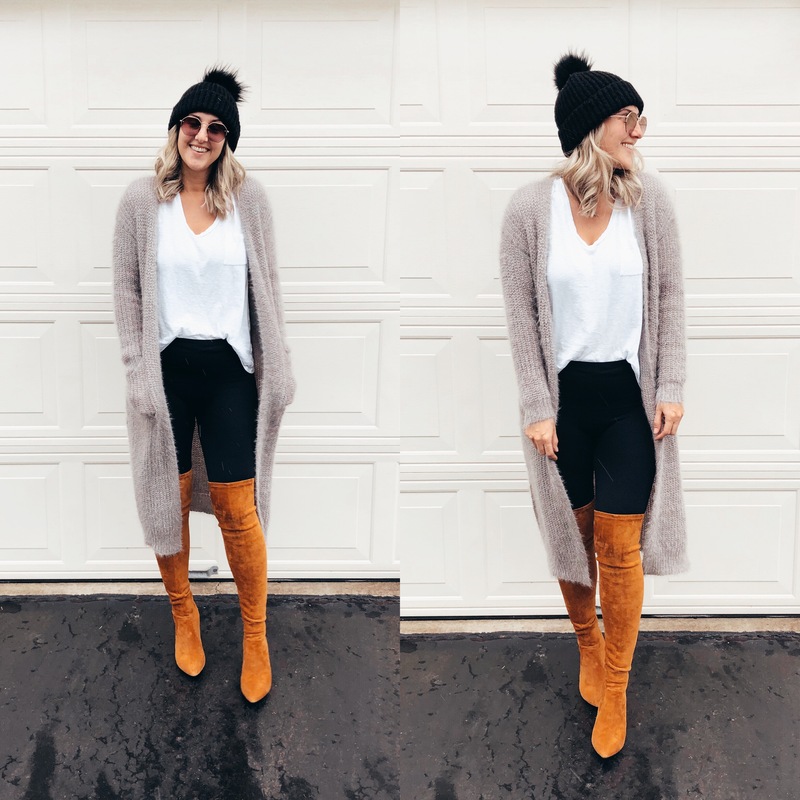 These boots look fab against white! Again, the teddy coat would be great paired with this outfit. You could do any variation of sweater or top with this look, but when I do winter whites, I try and stay in the same palette on top. I love doing white on white, or cream/white, or light grey/white. The sweater I’m wearing here is also from Heartloom and can be found HERE. My white jeans are amazing, and can be found HERE. Last but not least, an outfit for everyday. Guys. These Spanx leggings are my jam. I literally wear them 5 times a week, if not more. They are the seamless line, and oh so good. I sized up one in both pairs of mine, and they are perfect. The consensus is they run small. I paired the leggings with my favorite white tee, cardi, and beanie. A combo that could be done a thousand ways! PS- my favorite cardigan is on sale right now and comes in lots of colors! You can find it HERE. There you have it! I hope I’ve given you some good ideas for these boots. **A note about ordering from Goodnight Macaroon: The shipping can be at a snails pace. If you order the expedited shipping, it takes about a week to week and a half from order date. If you choose standard shipping, it can take up to 3 weeks. Just keep that in mind when you order. Also in regards to sizing, I ordered a half size up like recommended after reading their sizing info with these boots. I highly recommend reading the sizing info about them and making your decision based on that. They fit perfectly and I’m so glad I went with what they recommended. Please don’t hesitate to reach out with any questions! I’ve linked as much as I can of what I’m wearing below. Don’t forget to use code XOXOMARY for 40% off anything from Goodnight Macaroon! As always, thanks for reading!